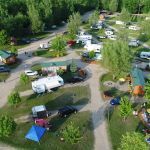 Ask fellow campers about "Covert / South Haven KOA" and nearby attractions. We went to visit the dunes during our stay, and it was ~1/2 hour drive to get there. Honestly, my only complaint, and it was a pretty major annoyance, is about the weeds that had small burrs in them that grew along the park's dirt roads. Unfortunately, our dog got burrs in all of her feet before we knew that they were there. The plants themselves weren't really obvious: they looked like any other small, short weed right next to the road and the burrs were green and not obvious at all. We hadn't gone 15 steps before the dog refused to walk anymore, and we had to carry her to and pick out about 20 burrs from the fur around her feet and in between her toes while she cried. (Which of course stuck our fingers while we were trying to remove them.) I think they should mow about six inches further in from the roadway, and that would solve the problem. Once we knew they were there, we were able to walk in the middle of the road and avoid them. We camped at Covert / South Haven KOA in a Travel Trailer. Sherman's Ice Cream is awesome! There are a few things to be aware of prior to making a decision to stay at this KOA: 1. The fee displayed on the website when making a reservation is not the fee you will pay. They charge a $6 per day "resort fee" which means that every site is $6 more than the quoted amount. You do not discover this until you have clicked the reserve button. 2. You are charged the full amount for your stay at the time of reservation. 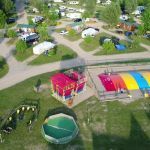 The KOA reservation policy states that normally you will be charged a deposit of one night's stay, but sometimes the campground may charge the full amount. But if that is the case, it will be stated on the specific campground's website; I could not find any such statement. Again, you do not find out about this until you click the reserve button. 3. They say they have free WiFi. However, they do not have free functional WiFi. The free WiFi seldom works even to just get email. When we questioned this they said it was because the campground was full and had too many people using it. However, we stayed beyond the weekend when the campground had maybe 10% occupancy and it only worked occasionally for a short time. They will sell you "premium WiFi" for $8. Our experience with the premium was better, but you still got dropped occasionally. Our attitude about the campground would have been better if these things were known before making the decision to stay in this campground. A few of the other negatives: •	Dirt/gravel roads and sites. The roads can be dusty and the sites dirty. Some sites have grass. •	Very few sites have any shade. Okay if you like to sit in the hot sun. •	Here are some of the good things: •	Staff is very friendly. Probably the KOA's staff is their best asset. •	Lots of activities for kids if you like that sort of thing - especially on weekends. •	Most sites are pretty good size. •	Some nice landscaping around the office. We camped at Covert / South Haven KOA in a Travel Trailer. Downtown South Haven is nine miles from the campground. For good Italian food, try Maria's, A Taste of Italy in downtown South Haven. Typical KOA resort with lots of activities for families. We were disappointed that our site was not paved or gravelled considering the price. Our site was sandy & fairly level. It was long enough for our 40ft motorhome & tow car. Free Wifi was advertised but not existent. Singled was not strong enough throughout the park to accommodate the number of sites. We camped at Covert / South Haven KOA in a Motorhome. This is one of our regular campgrounds we visit twice a year for blueberries and apples. Great staff that greet you like family. Had an issue with the power and I discovered a bad breaker, they fixed it in about 10 minutes. Clean everything and new improvements too, roomy RV sites lovely pool can't miss stopping here. Plenty of places to go within 15-30 minute ride. We camped at Covert / South Haven KOA in a Travel Trailer. Go to South Haven, Saugatauk and Cranes you pick and restaurant. Great pies and hard ciders. Very clean and accommodating place. Lots are spacious and offer some shade. Sites are dirt and grass, featuring a fire ring and picnic table. Big lots, blueberry picking right outside your place. The employees were very kind and helpful. WOULD and will stay at any KOA again! We camped at Covert / South Haven KOA in a Motorhome. Thanks for your great review! We are glad you enjoyed your campsite, blueberry picking, and that our staff was friendly and helpful for you. We look forward to seeing you again sometime! Thank you for camping with us! We are so glad you enjoyed blueberry picking and your campsite. We appreciate your review! Well shaded sites but very tight you must like your neighbors. Clean and easy to get to. Mostly shady, gravel sites with fire ring and picnic table. We camped at Covert / South Haven KOA in a Travel Trailer. Thanks for your review! We are glad you enjoyed your time with us, and appreciate your kind words. We hope to see you again sometime! Enter at your own risk with a big rig. The office does not mark your route for you, you get escorted to your site. We were taken down a road and were led to a site where we would had to make an absolute 90 degree turn between a tree and electric box. We thought we were brought down the wrong way because going around the opposite way gives you a direct shot onto this site. The fellow they parked next to us had less than 90 degrees (a no-no for big rigs and he should have refused) and the KOA young man led him right into the tree, taking it out and doing considerable damage to the motorhome. I looked at the map and the arrows indicated we were brought in the way the young man took us! The sites are poorly identified, the roads have NO markings to indicate which way you are to go but they are all one lane! We walked the area determining how to leave when it was time, again having no instruction or road markings or indications on their map. There is an exit gate with not a lot of wiggle room. To get to the outside road which gave you the best access we would need to go to the end of our road, make a less than 90 degree turn on a road lined with boulders to circle around to the perimeter road. My husband chose to go the most direct route, swing as wide as he could with me standing in front of the obstacles along the way. He had to hug a tree causing the branches to scrape the top of our rig to make the turn but we made it. A motorhome that left before us avoided the tree so didn't swing wide enough and took out their cargo doors on boulders. I didn't use any amenities so have no comment on them. Next time I will go to South Haven for about the same amount of money. I hope management addresses these shortcomings for RVers. They were more concerned about their 4.5 rating and their tree! We camped at Covert / South Haven KOA in a Fifth Wheel. We have stayed at this campground four times over the last eight years. It has its pluses and minuses. The pluses: Decent size sites, clean restrooms, okay internet, friendly staff, abundant recreation. 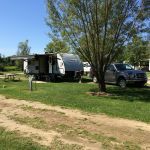 The minuses: Gravel drives (can be dusty), few trees (can get hot), nine miles to downtown South Haven - but still one of the best campground choices for a South Haven location. There are blueberries growing within the campground (when in season). The campground was close to full on a late August weekend. We will likely stay here again in the future. We camped at Covert / South Haven KOA in a Travel Trailer. Try the Sherman's Ice Cream store. They have free coffee when eating-in. Picked blueberries until we had all we wanted. Not much shade but the weather was perfect. Stay near the front as the back is loaded with mosquitoes but nice staff made us welcome. We camped at Covert / South Haven KOA in a Travel Trailer. Take the time to go to Saugatauk and enjoy the area. This was our first camping experience and close to home. We felt it was very expensive considering what they have to offer. Since we know the area and live 6 miles away it was just a practice run for us. They are nice people, not many people in the park in April and we only spent 2 nights. Maybe in the summer there would be things for people to do but not much when we were there. Not a lot of shade but nice sites. Park was clean and well kept. We camped at Covert / South Haven KOA in a Travel Trailer. Although the rain kept us from discovering anything this K.O.A had to offer, I did notice that the rain pooled on many of the roads and sites. This campground is 7-9 miles from any kind of restaurants or activities. It is a conveniently straight drive up 140 to South Haven though. I would stay here again if visiting South Haven We camped at Covert / South Haven KOA in a Motorhome. Our nightly rate is a bit high because we are a large family with 8 children so we had to pay an extra daily fee for a few of the kids. This is our fourth year at this KOA and the kids LOVE it! It's not perfect, but nearly. Heated pool, great jumping pillow (extra cost), U-pick blueberries on site, and large pull-through sites, some with concrete patios. The price is a little high considering you have to pay extra for all the activities, but the owners are GREAT and always looking to make improvements. You can tell they take pride in their KOA. The only thing that would make this place even better is paved roads only because after a rain or on a humid morning the dirt and sand create quite a mess. Otherwise, a great place to camp, especially with kids. We camped at Covert / South Haven KOA in a Travel Trailer. All time best KOA we've ever seen. Clean, well maintained with super friendly and helpful owners and staff. 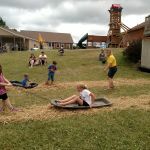 Lots to do for the kids with jumping pillow, enclosed trampoline with basketball hoops (my kids LOVED this), great playground, and much more. Lots of scheduled activities as well. Our site was a decent size, quiet and shady. Would highly recommend this campground. We camped at Covert / South Haven KOA in a Travel Trailer. Are you affiliated with Covert / South Haven KOA ?